The new strategy is being tried after company abandoned its most ambitious bid yet for a temporary fix Saturday when BP said the “top kill” option — an attempt to overwhelm the broken well with heavy fluids and junk — had failed. That strategy, which sought to stop the flow of oil, was always a long shot, Robert Dudley, the company’s managing director and head of disaster management, told NBC’s David Gregory on Sunday. The probability is “much better” that the new approach, which seeks to contain the spread of the oil, will show good results this week, he said. “I think the engineering on this is more simple than the top kill,” Dudley said. BP hopes to use a diamond-cut saw to slice through a pipe leading out from the well and cap it with a funnel-like device using the same remotely guided undersea robots that have failed in other tries to stop the gusher, Dudley said. The spill has dumped 18 million to 40 million gallons into the Gulf, according to government estimates, exceeding even the 1989 Exxon Valdez disaster off the coast of Alaska. 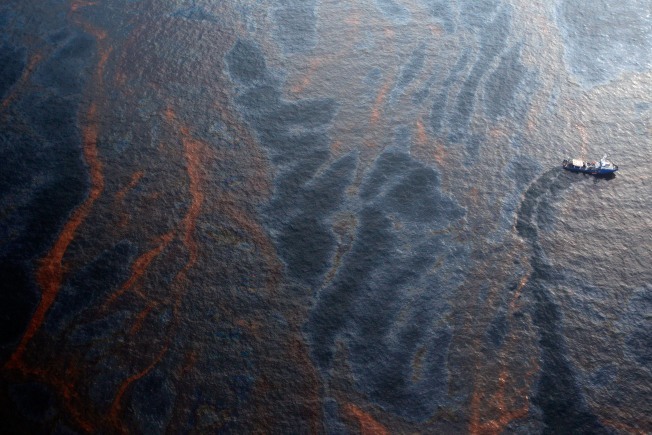 The leak began after the Deepwater Horizon drilling rig exploded in April, killing 11 people. Experts have said a bend in the damaged riser likely was restricting the flow of oil somewhat, so slicing it off and installing a new containment valve is risky. News that the top kill fell short drew a sharply worded response Saturday from Obama, a day after he visited the Gulf Coast to see the damage firsthand. “It is as enraging as it is heartbreaking, and we will not relent until this leak is contained, until the waters and shores are cleaned up and until the people unjustly victimized by this manmade disaster are made whole,” Obama said. In the days after the spill, BP was unable to use robot submarines to close valves on the massive blowout preventer atop the damaged well. Then, two weeks later, ice-like crystals clogged a 100-ton box the company tried placing over the leak. Earlier this week, engineers removed a mile-long siphon tube after it sucked up only 900,000 gallons of oil from the gusher. Meanwhile, efforts to mitigate the damage continued as soldiers of the Louisiana National Guard completed a barrier wall Saturday on the shoreline of Port Fourchon. The 2½-mile barrier wall is supposed to protect Bay Champagne from encroaching oil, officials said. Bay Champagne is a coastal lake considered critical to Louisiana’s wildlife and its seafood industries. The project, which began May 21, involved placing about 1,000 steel mesh basket units along the beach, each filled with about 7,500 pounds of sand. Officials said they were optimistic, but they warned that the damage that has already been done could be catastrophic, especially to the state’s seafood industry. In a joint letter addressed to Chief Executive Tony Hayward at BP’s London headquarters, the heads of several state agencies complained that the company’s failed efforts to stem the oil had eroded public confidence in the economy. “Given the size and magnitude of the Louisiana seafood industry, and given the generations of work that has been done to build the Louisiana brand, we believe the investment required is not insignificant,” said the officials, who included the heads of the state health, environmental, wildlife and agriculture departments. “The future of this industry is in peril,” they said.